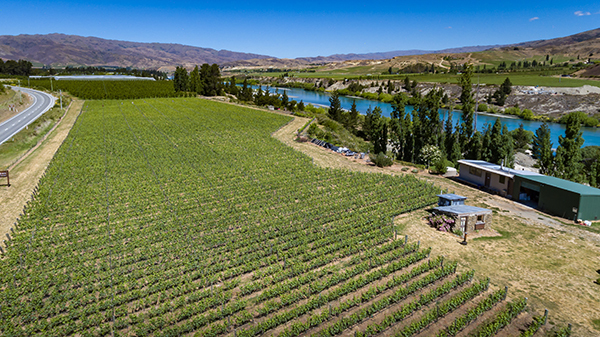 In 2017 Nockies Palette Wines went a step further when it acquired the historic Georgetown Vineyard in Central Otago and added Pinot Noir and Pinot Rose to the palette. The vineyard was once a mining settlement and was thought to be used by the local blacksmith a century ago. An old miners hut still sits beside the Kawarau river on the property which is near the Cromwell entrance of the Kawarau Gorge. It has a unique micro climate that is particularly suited to the growing of super premium Pinot Noir grapes. The vineyard is planted in a Burgundian style with hobbit-sized vines, low and in close rows, which can be more difficult to manage than the typical new world approach to growing vines but densely packed style of planting is believed to enhance the quality of the fruit. To help with the making of a grand cru style of Burgundian pinot, that still specifically expresses the sense of Central Otago terroir, multi award winning wine maker Pete Bartle is overseeing the production of the new Nockies Palette Pinot Noir and Rose wines. Pete Bartle has established himself as one of Central Otago’s most successful and respected winemakers with his no nonsense, passionate approach to winemaking. This approach has lead the wines he has made to be met by critical acclaim throughout his career. Pete has been in the wine industry for 25 years with 17 of those as a winemaker in Central Otago. He loves vineyards and really enjoys working alongside the vineyard team getting to know the site from the ground up. He believes wines are grown, with most of the good work done before the fruit arrives at the winery. It is his job to coerce the best out of the grapes the vineyard has produced and to make wines with poise, texture and balance. Pete, a Hawkes Bay native lives in Alexandra with his wife Dora and sons Oscar and Pedro. Outside of work he likes to spend time with his family and to keep fit by cycling. Pete Bartle brings a natural talent and sixth sense for bringing the best out of a grape combined with a deep understanding and knowledge of the region and what it can offer. Pete is assisted by local viticulturists Tim Deaker and Jason Thomson from Viticultura. Team members of Viticultura working at Georgetown Vineyard.